The Instagram shadow ban is one of the most discussed topics related to Instagram in most recent times. The problem is that there are so few answers out there to properly understand what the Instagram shadow ban is, how it works, and how you can avoid it. And Instagram isn’t saying a lot about it either. You’re probably here because you’ve found your engagement dropping on Instagram in the recent times. Did you also know that this could be a sign of you being a victim of the Instagram shadow ban without you even knowing it? But even if you haven’t noticed any strange signs of an Instagram shadow ban, you’ve maybe found yourself here as preemptive measures. If that’s the case, smart! Because if you have just heard briefly about the Instagram shadow ban, you’ve probably heard about the damaging effects it can have on an Instagram account. Especially if you’re using your Instagram account for business purposes. In this post, we’re going in-depth about the Instagram shadow ban and learn everything there is to know about it, in order to avoid it and to stay in the clear. I’ll be asking common questions about the Instagram shadow ban that still lack good answers, and I’ll give you solutions that will help you operate without worrying about being crippled by Instagram’s secret ban. The Instagram shadow ban was first brought up and started to gain traction in the discussions about Instagram, in March/April 2017. If there’s still some parts about the Instagram shadow ban that are vague with information today, at that time, people knew nothing. The problem was rooted in a drastic decrease in organic engagement/reach on Instagram. Not slowly decreasing which is generally quite normal as time passes (especially if you don’t continuingly add new followers), but dramatically decreasing, over the course of a few days or weeks. This drastic decrease in engagement was something that people really only had witnessed once before, and that was when Instagram launched their algorithmic feed and replaced their chronological feed. The problem with the decreasing engagement, which back then hadn’t acquired the name Instagram shadow ban, was closely related to the usage of hashtags. It eventually became clear that the Instagram shadow ban had a lot to do with the usage of Instagram hashtags, or, in Instagram’s eyes, the improper use of hashtags. Why does the shadow ban exist? One of the most common questions regarding this topic is ”Why does the Instagram shadow ban exist?”, and really, the answer is quite simple. It exists for one reason and one reason only essentially. That reason is to protect the Instagram community from bots and excessive spam. When you understand that preventing spam is the only goal with the Instagram shadow ban, you better understand why it exists and what type of actions may lead to you getting banned. After some time, when little information still existed about the Instagram shadow ban, it eventually became clear that the ban had something to do with Instagram hashtags. This is because the vast majority of people who had been struck by the effects of the Instagram shadow ban had been behaving in a spammy way on Instagram. Much of the spammy actions tying back to hashtags. Hashtags on Instagram are a powerful tool. They can greatly increase your engagement on Instagram, and they can help your post get significantly more exposure, especially if your post ends up on the ”Top posts” section. But with power comes responsibility, and like all social platforms, Instagram is struggling with cracking down on spammy bots, and this is quite a challenge, to say the least. But for some context, it’s good to get a better understanding of the whole purpose of Instagram hashtags. 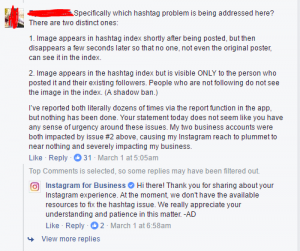 The reason hashtags on Instagram exists isn’t to help you gain more exposure, but instead, it is to help people filter and categorize their posts and show up on relevant hashtags related to that particular hashtag in order to allow people interested in that exact thing to explore posts related to their area of Interest. The idea is great, but there’s just one small problem, and that is that we’re not living in a perfect world, and in that perfect world, each and every post using the hashtag ”car” would include an image of a car, and every post on Instagram with the hashtag ”computer” would include an image of a computer”. This is really where it gets interesting and where you can understand where Instagram is coming from with its Instagram shadow ban. The problem Instagram had with its hashtags was that people were excessively using them, improperly using them, and most importantly, adding irrelevant hashtags to their posts that actually had nothing to do with the image. And this takes away the whole point of hashtags from Instagram’s point of view, doesn’t it? If people aren’t using hashtags the way they’re set out to be used, Instagram had two options. The first was to completely remove the hashtag feature on Instagram, but because the feature was and still is so immensely popular, every wise man or woman would understand that that would be a foolish move. The other option would be to try to crack down on the people who were misusing the Instagram feature by limiting their ability to have their posts with hashtags surface to other people’s hashtag feeds. The rest is history. Also, many of the bots that are created on Instagram aren’t created to only sell followers to people, but some bots are also created to go to Instagram and spam promotional messages. The problem is that with Instagram cracking down on bots so much, they don’t live a very long life. This is why the bots need to get their message across quickly, before being banned. The best way to do that when you’re starting out with zero followers? Hashtags of course! This means that Instagram wasn’t just facing a problem with regular people excessively spamming hashtags on Instagram in an incorrect way, but they also faced real bots spamming hashtags and cluttering the hashtag feed. All of these things were problems that had to be solved, and Instagram came up with the brilliant idea of the Instagram shadow ban. Instagram obviously couldn’t remove the whole hashtag feature, but what it could do was block/ban certain hashtags that were almost solely used for spam-purposes. In other words, almost exclusively used by bots and spam accounts. This would limit their reach, and it would also remove hashtags that didn’t really fill any function. This is why, as a first step of the Instagram shadow ban, they banned specific hashtags from being used in order to crack down on the worst spam that clearly didn’t bring any value to the community. And Instagram didn’t ban a few hashtags, either. in fact, a while back, it was reported that they banned a total of about 60,000 hashtags! The scary thing about the Instagram shadow ban is that by using only one hashtag which has been banned by Instagram, Instagram may prevent that whole post from surfacing on any of the hashtag categories you have added to that specific post. Now, when Instagram ”bans” hashtags, it doesn’t mean that they remove the whole hashtag, even though they’ve done so on some specific terms that are sexual, racist, discriminating, or in any other way inappropriate. When they ban hashtags out of spam perspective, however, the category of ”top posts” will still be visible, because the posts that are being shared by top accounts aren’t generally spammy by nature. Instead, it is when you switch to ”Recent” that you’ll see the message – if the hashtag has been banned. The bottom line is that in this drama, Instagram has to deal with two ”types” of users who are misusing the hashtags in a way which they weren’t intended being used in. One of the biggest challenges Instagram has today is cracking down on bots, spam, inappropriate content, and other spam-like behaviours which can damage the community, and the Instagram shadow ban has been a stepsin the right direction from Instagram’s point of view as the results they have achieved have been the exact results that they wanted to achieve. If you want to peep through your fingers, there’s a big list of banned hashtags available if you search for it. Which are the banned hashtags? The main reason is obviously that they have been used by accounts posting spammy content, however, a universal trend for banned hashtags which aren’t of obvious inappropriate nature is that they are very generic. And when you consider that the idea of Instagram hashtags is to enable exploring and discovering particular posts within a specific area which you’re interested in, these hashtags aren’t fulfilling these criteria. With the hashtag #tgif, for example, you can find virtually any type of post, and this kind of removes the whole purpose of hashtags on Instagram in the first place, right? Some more background context is that shadow bans first appeared on Reddit. The shadow bans gave moderators the power to ”silence users that didn’t contribute to the site in a constructive way”, in other words limiting their reach without letting them know about it – thereby the name shadow ban, because you aren’t notified by Instagram (nor Reddit) that you’ve been banned. For the account that is struck by the shadow ban, unless you aren’t alert, you won’t notice it. You can use Instagram just as usual, the only difference is that your reach by using hashtags is limited. In some cases, people aren’t able to reach anyone. The problem with shadow bans is that they can affect innocent people too. Yes, the Instagram shadow ban has, from Instagram’s point of view proved effective as it has significantly reduced spam, the improper use of hashtags, and limited bots’ reach on the platform. The problem, however, is that the shadow bans aren’t given by real humans, but rather programs that Instagram has created with the purpose of identifying spam-like behaviour. This means that the shadow bans can be given to innocent people, and thus significantly damage their reach on Instagram. Since Instagram hasn’t been very open with the Instagram shadow ban, it’s not yet clear whether or not the Instagram shadow ban is limiting the reach of the pages that have been banned, or if the ban is limited only to hashtags, but based on what we can read between the lines, it seems to be mainly connected with the hashtag feature, as this is the feature which Instagram has the most trouble with when it comes to excessive spam. The ban restricts your reach to only your followers meaning that you have a very hard time growing your page. This is because the only users that you can reach are the ones that are already following you. Of course, there are a number of other ways you can grow your followers on Instagram, but since hashtags on Instagram are so powerful, it hurts a lot to lose it – especially for businesses using Instagram as a marketing tool. How to find out if you are shadow banned? Finding out whether or not they have been shadow banned has been one of the biggest challenges people have had. Since the discussion of the Instagram shadow ban came around, it has almost become a paranoia among people, who imagine things that just aren’t true because they receive one like less than they’re used to. 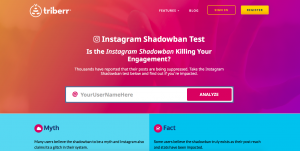 Fortunately, a few helpful tools dedicated to the Instagram shadow ban and analyzing your account to see if you have been banned. Do note, however, that these tools might not be 100% accurate, however, since it is very difficult to know if you’ve been shadow banned or not manually, they’re definitely better than nothing. Simply type in your username and a link to a post of yours that you want to see whether or not is banned. The reason that you only scan specific posts is that the Instagram shadowban doesn’t apply at the account level, it only applies to some posts -most of the time. When pasting a link to a post of yours, make sure you paste one where you have used hashtags in order to see whether or not the hashtags for that particular post work and are active. Make sure you try it out on a number of posts where you have used hashtags and then draw a conclusion from that. What causes an Instagram shadow ban? How can you avoid being banned? With all of the things we’ve talked about in mind, it’s quite obvious what the cure for not being hit by the Instagram shadow ban is: undermining yourself to Instagram and avoiding any type of usage and behaviour on Instagram which can be seen as spam or bot-like behaviour by Instagram. And note that it is not real people who identify the people who are spamming, but programmed bots, and so this means that you need to avoid actions that can in any way be misinterpreted as being spamming. The short answer is that you should avoid all actions that can be viewed as spam. This is if you want to stay fully on the safe side. However, since the Instagram shadow ban only focused on hashtags and specific posts’ visibility there, it is the misusage of hashtags on Instagram that you want to focus on. Make it a principle to use Instagram as a human and you shouldn’t have to worry. While Instagram doesn’t say it explicitly, they emphasize the importance of great content before hashtags. 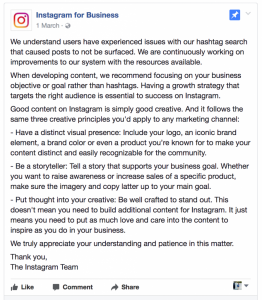 They mean that users shouldn’t rely on exposure from misusing hashtags, but instead, they want to encourage their users to share great content rather than spamming hashtags. But it seems that Instagram was very well aware of what was happening as it is they themselves who have crafted the Instagram shadow ban. The only problem might have been that their program for detecting users who were misusing hashtags was affecting people who weren’t really bots, but rather was unknowingly doing something that could be misinterpreted as spam, for example using the same set of hashtags over and over. Instagram said in another message that they ”don’t have the available resource to fix the hashtag issue” and this is very interesting since they designed the shadow ban. The challenge they struggled with, however, was fine-tuning it to mainly go after real bots and spammers who were actually doing serious damage to the community. And considering that it was a while ago that Instagram first ”launched” their shadow ban, they’ve probably been able to fine-tune it, and are continuingly fine-tuning it to improve its efficiency. Something that has been found causing the Instagram shadow ban is using the same hashtags over and over for a long period of time. Well, the shadow ban is in place in order to prevent spam, and using the same hashtags over a long period of time can be viewed as spam. But that’s not all. The main reason that people who use the same hashtags time and time over is that very seldom are all of these hashtags relevant to each of the posts that I share. For example, I might have a car page where I post pictures of cars, and then have a set of 30 hashtags which I use for each of my posts. But let’s say I have the hashtags #Ferrari and #Lamborghini in that set. Only when I share photos of Ferraris respectively Lamborghinis, those hashtags will be relevant to that post. Sure, the hashtags are similar in nature and related to any car-related content, however, the purpose of hashtags on Instagram is that when you go to the hashtag #Ferrari, you expect to see photos of Ferraris and nothing else. This is what Instagram is partly trying to achieve by making the hashtag feature more relevant to its users for discovering photos. The bottom line is that to avoid becoming Instagram shadow banned, you want to make sure that you aren’t using the same hashtags for every single post you share, and this is essentially rooted in the fact that you want to use relevant hashtags to your posts, and this brings me to my next point. If you’ve researched how you succeed with hashtags on Instagram, you’ve probably found that using niche-specific hashtags are far more beneficial than using generic hashtags. On the other hand, if you use generic tags, you can actually receive quite a high engagement, however, the catch is that that engagement doesn’t come from relevant people. Most often, the engagement that comes from using generic hashtags are from bots, and you know what Instagram things of spam-like activity? Well, the bottom line is that because you are using these generic hashtags that are most often being used by bots, and which aren’t really related to your post, you might find yourself shadow banned, and this is why you want to do the opposite. If you want to make the process easier, you can create a few sets of hashtags which include tags that are related to images that you often post, however, you also want to make sure you optimise each and every tag that you include in your posts so they really are relevant and related to the post. By now, you know that Instagram has ”banned” a lot of hashtags as they often have excessive spam content and content that breaks Instagram’s guidelines. These hashtags have big red warning flags in Instagram’s eyes when it comes to spam and spam-like behavior, and this means that only using these spammy hashtags might raise a spam-warning flag on your account. The banned or broken hashtags have been and are so heavily used by bots that Instagram doesn’t find that they bring any value to the community. And what do you think it says about your post when you use these hashtags? This, of course also means that a lot of innocent people who have no idea that the hashtags they’re using are spammy. The punchline is that in order to avoid the Instagram shadowban, you need to be thoughtful about which hashtags you use, and go through them one-by-one in order to see that they aren’t banned or broken. These are essentially spam and bot softwares used to grow followers, spam on the platform, and so on. If you’re using these, you’re no longer doing actions that look like spam, but you’re actually spamming on the platform. Throughout the years, Instagram has become more and more strict against bots and other services with which you can connect your Instagram account. In fact, within a short period of time, the two largest and most advanced Instagram bot softwares Instagress and Massplanner. When Instagram was just a baby, it didn’t have any advanced systems in place to detect bots and spam-like behaviour, but today, they do. If you are using a bot software for spamming on Instagram, Instagram will most likely find out about it. And if they do, they’ll either permanently ban your account, or, shadow ban you. If you weren’t aware, there are limits on how many photos you can like, comments you can leave, and accounts you can follow or unfollow. However, everyone’s limits are different! According to AndroidTipster, your account’s ability to like, follow, and comment grows at the 3 months mark—but there are a ton of other factors that Instagram considers when determining your account’s daily limits. In any case, try not to exceed 150-200 likes, 60 comments, and 60 follows/unfollows per hour! The reason Instagram imposes limits on user activity is to crack down on bots. If all of a sudden you follow 50 accounts, and then immediately unfollow 25 of them, Instagram might interpret this as “bot activity” and shadowban your account as a result. Easier said than done, however, you do actually carry a great deal of power over whether or not other people report your account. If you have it as your policy to follow the rules and be kind to everyone, you probably aren’t going to get reported. 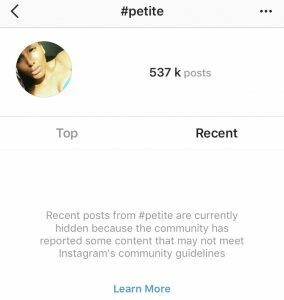 If you get reported by other users over and over, you’ll end up on Instagram’s radar, and this can ultimately lead to you being shadow banned. Of course, in order to get Instagram shadow banned or even banned, you need to have actually broken any rules. It’s simply not enough to just be reported many times. The problem, however, is that if you are breaking the rules, and then have a lot of people reporting your account, Instagram’s eyes will be open to your account, and thus the risks of you getting shadow banned much greater. Essentially, as mentioned earlier, everything that is bot-like behavior is activities you need to stay away from. Remember that the whole purpose of the Instagram shadow ban is to decrease spam and activity that is against Instagram’s terms, and if you are performing actions that can be viewed as spammy and bot-like, you might see your account being hit by the Instagram shadow ban. This can include actions like commenting on an excessive number of posts in a short period of time, liking a lot of posts, following/unfollow many pages within a short period of time. What to do if you’ve been hit by the Instagram shadow ban? Okay, for some reason, your account has been hit with the Instagram shadow ban. You’ve seen your engagement heavily decrease within a short period of time, and you only seem to be reaching the people who are following you with your posts. You feel powerless as the iron hands of Instagram are impossible to fight against. In fact, there are a number of actions you can take to free yourself from the chains of the Instagram shadow ban and make the process quicker and less painful. The most obvious answer to what you should do if you have been hit by the Instagram shadow ban is to stop doing the things that got you banned in the first place. Again, understanding where Instagram is coming from and the reason they created the Instagram shadow ban is very helpful. Then, start following the steps above. There are people who have been affected by the Instagram shadow ban who have tried different ways to get rid of the ban – and succeeded, and what this indicates is that there are several paths to the same destination. This includes both your sets of hashtags (if you have created such), as well as on your older posts. In order to regenerate your account, you need to first clean it from its sins. Therefore, begin by first going through each and every one of the hashtags you’ve been using and see if any of them are broken or banned. If you find hashtags in your set of hashtags that you’ve used, go through each of your posts where you have included those tags and remove those hashtags (or remove the post). Also, do remember to not use these hashtags in the future. There are people who have been hit by the Instagram shadow ban and then taken a short break from Instagram for about 48 hours, then come back to find that their account is free from the ban. If you want to give this method a try, avoid any Instagram activity, which includes logging in, posting, engaging – heck, even using the app. The people who have used this method and succeeded means that this gives the account time to reset and show that it is, in fact not a bot which operates around the clock non-stop. When you return after your paps, remember to take it slowly, and engage manually. Don’t perform actions excessively and too quickly as this might trigger the ban again. Again, the reason that Instagram introduced the shadow ban was to crack down on spammers and bots who were breaking Instagram’s terms and conditions. This is why, if you have found your account shadow banned, you’ve probably broken Instagram’s rules, and from here on, you need to start following them if you want to get rid of the shadow ban. You should definitely not try to find glitches and hacks to boost your engagement or following, but instead, make sure you use the platform the way it is intended. Some people have found that it was when they converted their account from a personal account to a business account that they got shadow banned on Instagram. While this certainly isn’t proven, there’s a theory that the reason for this is that Facebook (owner of Instagram) wants to force the businesses that are using Instagram to buy ads on the platform by limiting their organic reach. 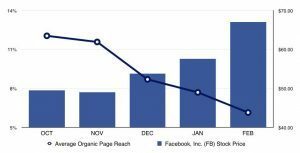 While this is yet only a theory, those that claim that it is the case means that Facebook is notoriously known for having decreased the organic reach on Facebook over the years in order to get more businesses buying ads on the platform. And if you look, there is an undeniable correlation between the decrease of organic reach and stock price, but whether this is done intentionally by Facebook I leave uncommented. If you have converted your Instagram account to a business account from personal account and in about the same time period also seen your organic reach decrease, it is worth testing change your account back to a personal account. It’s impossible to fight against those much bigger and more powerful than you, and therefore, a solution is to just ”give up”. Of course, as you probably know, getting in touch with Instagram or Facebook through customer service is quite a challenge in itself, but if you don’t try, you’ll never know. To report the issue you’re experiencing (your posts not surfacing in hashtags on Instagram), go to your profile, tap the icon in the top right corner of your screen, and then scroll until you find ”report a problem”. Click it and select the option ”something isn’t working”. Now, give a short description of the problem you’re having and how hashtags aren’t working for you. 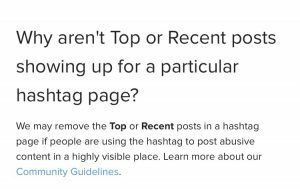 Avoid explicit saying that you’ve been Instagram shadow banned or that you have seen a decrease in engagement, but rather report that you’ve noticed that your posts are nowhere to be found in hashtags. The people who have used this method have repeated it several times a day, and some have had their problem solved this way, but remember that Instagram may never respond. At the same time, if you don’t message them, you can be 100% certain they won’t respond. The Instagram shadow ban is a highly debated topic, to say the least. Instagram has been very restricted with information about the topic, and they’ve never explicitly admitted that there is an Instagram shadow ban. Instagram is, however, continuously working hard to crack down on bots, spam, and spam-like behavior, and through its history, the way they’ve done so has been to ban and temporarily ban users who have been performing spam-like activities on the platform. Instagram’s hashtag feature us a powerful tool, and it is loved by its users, but at the same time, if people are using it to spam and are using it in an incorrect way, it damages its purpose, and this is why Instagram has put in place a so-called shadow ban which focuses on the misuse of hashtags and limiting people who are misusing the hashtag feature from getting exposure. Have you been affected by the Instagram shadow ban? Let me know in the comment section below! I’d love to hear about it! PrevCan I Set Up a Second Instagram Account? I got shadow banned in March, it took me about 2 weeks to realise what was happening as there is very limited information out there at present and Instagram are keeping very quiet. Mine happened after a hack, which many others are revealing too. The hack being that my email and password got changed, once I got back into my account Instagram saw me as a spam-bot. I think the hack has greatly affected Instagram’s algorithm and they don’t yet know how to fix it, hence why they are being so quiet. The only statement they have made is for us ‘to be patient whilst they try and resolve’. I believe some people are trying to sue due to loss of earnings. More sites/ news need to pick up on this to light a fire under Instagram to get them moving faster. There is a lot of conflicting information out there’ stop posting for a while’, ‘carry on posting as usual’, ‘contact Instagram daily’, ‘only contact them once’. Personally I’ve reduced my posts, mostly because I don’t want to spend time marketing with minimal or no return. Hopefully Instagram will fix this soon. Sorry to hear that you have been affected by a shadow ban. It’s definitely very frustrating, especially when you don’t know what to do about it due to the (very) limited information from Instagram. I guess we have to wait and see what Instagram says about it and if they will give us some more information in the future. It sounds like you have decided on a strategy. Wasting time on posting pictures that have a very limited reach doesn’t seem like a very good option. Let’s hope Instagram will solve this issue for you and all the other people that have been affected by this. I run a business Instagram page, that I have been posting for months in gaining momentum. About two weeks ago it just hit a dead end. I’ve used the same hashtags for months getting new followers every day, and about 40-70 likes immediately. Now when I post I get a max of like 4 likes. I knew something happened and believe this is what happened. I need help getting out of this dead end. Sorry to hear about the shadow ban it sounds like you have been affected by. Some believe that using the same hashtags over a longer period of time can trigger a shadow ban. If you have spam-liked a larger amount of photos over a long period of time, it might have affected the ban as well. Because the information from Instagram is very limited, its hard to give you a concrete answer but try skipping the hashtags for a while and like/follow/comment less. Some people have experienced an easy of the shadow ban in this way and it might help you as well. Thank you for visiting VeloceInternational. I have the same problem as Simone. I am glad i found out what it is, as I have been trying every possible suggestion I could find on the interne. For me this is a little disaster as I am a start up. Thank you for explaining this phenomenon. I tend to leave my instagram account alone for a while. I did find some of my accounts shadowbanned a while back, but now, things are looking like they’re clearing up. Are things officially back to normal? if so how long did it take? If you’ve been shadowbanned, make sure you stop doing all of the practices mentioned in the article. When you’ve done so, getting everything back to normal won’t take long at all, in fact, you might even see everything going back to normal within a few days. However, it’s important that you don’t confuse the algorithm with the shadowban, because even if everything has gone back to normal, you might be experiencing a lower than normal engagement on Instagram, but this is something that is true for the vast majority of Instagram users as a result of the decreasing organic reach. even if I follow all the instagram community guidelines my personal hashtag #bananartista is hidden (none of my 1620 posts is visible now) and for this reason my page @bananartista (https://www.instagram.com/bananartista) is shadowbanned. This is a tricky one for obvious reasons. My best advice is to go to your profile settings and click “report problem” and then describe the problem you’re experiencing.